Nancy Gianni, of GiGi's playhouse began her talk at the DSDN Mom retreat this past Saturday with a story of her oldest child. One night as a baby her husband brought in their little boy, this little inconsolable baby to her. He was still crying as she took and held him, but then as she laid her hand on his cheek he nestled in and calmed down. Nancy went on to explain the power of the hand; the power of a mother’s touch. Throughout her talk we saw evidence of the power of what our hands can do as we learned the how and why behind the creation of GiGis Playhouse. Rachel Coleman of Signing Time was our keynote speaker on Friday night. She demonstrated the power of signing, when it came to her family and their story. Life has a way of taking us into uncharted territory but her hands have been an instrumental part of her family’s story. Not only were her hands a big part of opening the world up for her girls, but her hands have turned their story into the Signing Time episodes and videos, which has been powerful to so many families. The power of our hands. It makes me reflect on the DSDN logo, the hand. 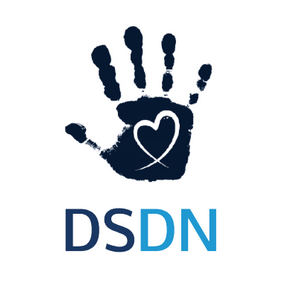 All of this, the retreat which brought in 300 moms to Chicago this past weekend, the 4000 families involved in the Facebook groups, and the more than 400 new families DSDN has helped in 2017 alone. All because Heather Bradley and Jen Jacob decided to connect and help moms, and continues to work to change the diagnosis delivery. The power of the hand. I have said countless times that DSDN was a game changer for me. While in desperation to connect, to find common ground with someone, anyone, I posted in a NICU Facebook group one day. I posted about how lonely the journey was with having a 2lb baby, and then add in a diagnosis of Down syndrome. A mother reached out to me to tell me about DSDN and something called Rockin’ Mom groups. She got me in contact with Jen. From that moment I knew I wasn't alone, and it has made all the difference. A saying the Rockin’ Moms like to use is, "You’ve got this, and we’ve got you." I witnessed this and watched this happen in my own personal story. Saturday at the retreat another couple of moms stood up and talked about their new nonprofit. I couldn't help but think of just how influential Heather, Jen, and DSDN has been to all of us. The power of the hands. As Jen saw the need for connections after their own diagnosis, and began the Rockin' Mom groups. Not only has she been influential in DSDN but her and others have influenced many of us to put our own hands to work.These ladies; Nancy, Rachel, and Jen have helped show us that it is possible, and that we can change the world. Jen not only has united us in these groups called the Rockin' Moms, but has also inspired many of us to put our own hands to work. Whether it be our own nonprofits, advocating in our community, volunteering, or being the best parents we can be. It is safe to say this lady has encouraged me and shown me it is possible to take an idea and turn it into reality. She has helped and answered questions as I worked to get Mighty Miracles Foundation going. So what I leave this 2017 retreat with along with memories made with 300 of my closest Rockin’ friends, is inspiration and encouragement from these women who have all shown the power of a mother's touch; the power of the hands. And I looked to my hands to hold on. And my hands did so much more."